The price of gold should be $2,500 per ounce. While this may appear to be an overly optimistic projection, it is reasonable when analyzed in the context of today’s highly inflationary environment. Inflation occurs when central banks create excessive amounts of money and today we are in the middle of the largest money creation exercise in history. Since 2000, the supply of US dollars has grown by 84% and since the early 1970s, when official dollar convertibility into gold ended, the number of dollars in circulation has grown by over 1400%. That is not a typographical error. In 1971 there were 776 billion US dollars in circulation. Today there are over 12 trillion. Around the world the supply of paper money is growing at a stunning pace. In the last seven years alone, the supply of British pounds grew by 99%; Euros grew by 78%; Indian Rupees grew by 234%, Chinese Yuan grew by 227% and Russian Rubles grew by 1,508%. Because central banks create money at virtually no cost, its supply tends to grow without constraint. Like dollars, pounds, Euros, Rubles and Rupees, gold is also a currency that is freely traded, highly liquid and exchangeable into other currencies. There are numerous arguments for denominating a percentage of one’s cash balances in gold money. Each of these arguments is built upon the fact that the supply of gold, unlike that of paper money, can not be increased at the discretion of a central bank. In times of excessive monetary growth, as we are in today, gold increases in value relative to other currencies because the growth in its supply is significantly lower than the growth in supply of paper money. The current gold price does not yet reflect the amount of money creation we have witnessed in recent years. It also does not reflect the amount of future money creation that will be required to service the massive level of debt that is growing in the global financial system. This is because central banks have conditioned the public to expect unrealistically low levels of inflation by promoting misleading inflation statistics and by keeping money supply growth out of the public eye - last year, as US dollar expansion accelerated to levels not seen since the 1970s, the Federal Reserve ended its 47 year policy of publishing broad money supply statistics. We are now witnessing a global competitive currency print-off in which success, perversely, is measured by currency weakness rather than strength. In the following pages I analyze the investment merits of owning gold in this environment of unprecedented monetary growth. I explore why inflation expectations are unrealistically low and how this has temporarily suppressed the gold price. I review how money is created and I look at how currency intervention and ballooning debt levels are accelerating its growth. Finally I show that gold, as a currency in a floating exchange rate system, is significantly undervalued. With supply unequivocally constrained and demand beginning to grow on multiple fronts, it is not difficult to arrive at a US dollar exchange rate for gold that is greater than $2,500 per ounce. It is October of 2007 and we are in the middle of a powerful bull market in gold. From its low in 2000 of $255/oz, gold has risen to $785/oz (a 208% increase). Despite the magnitude and duration of this move, gold remains misunderstood by both the public and professional investment communities. We often hear that gold is a hedge against inflation but few people understand the drivers of inflation or its relationship to the gold price. Many think about the gold price relative to where it was seven years ago or where it is in relation to its 1980 peak of $850. While these comparisons are understandable, they are also arbitrary and irrelevant to the determination of a present day value for gold. Instead we need to focus upon today’s monetary environment and the likely scope of future monetary policy. When viewed from this perspective it becomes clear that gold, at $785, is still incredibly cheap. In this paper I avoid any discussion of conspiracy or predictions about the demise of paper money that characterize much of today’s literature on gold. Instead, I analyze gold as an undervalued currency that has an important place in a portfolio of securities. At the end, I present a framework for determining an appropriate US dollar exchange rate for gold. In today’s environment of excessive monetary growth, central banks have a very difficult time achieving their stated goal of controlling inflation. Most people associate inflation with higher prices but they fail to associate higher prices with loose monetary policy. When too much money is created, each unit of currency loses value and more units are required to buy the same number of goods. The goal of the central bank (in the US, the Federal Reserve Bank) should be to supply, but not exceed, the market’s demand for money. Theoretically, if the market’s production of goods and services is growing by 2% (demand growth = 2%), and the Fed increases the money supply by that amount, prices will be stable. In this example, the volume of money relative to the number of units of production remains constant. Alternatively, if the money supply grows in excess of 2%, say 11% as it did in 2006, then the volume of money becomes proportionally greater than the number of units and prices rise. The price increase will not occur uniformly across all items in the market. This accounts for why inflation is typically understated by the most popular inflation indexes which not only measure a relatively narrow slice of the broader market but also exclude many of the items that are inflating the most. In addition to the items that these indexes exclude, elements of their basic methodology are biased towards understating inflation. e.g. If the price of a computer rises by 50% but its processing power increases by 100%, The Consumer Price Index (CPI) treats this as a price decrease. Furthermore, the way in which categories within the index are weighed assumes “that consumers can alter the quantities of goods and services they buy,… when the relative prices of those goods and services change.�?1. i.e. the index only includes part of an actual price increase because it assumes that consumers “insulate themselves from the impact of higher prices by adjusting their spending to favor relatively lower-priced goods or services.�?2. In this context, the CPI is no longer measuring inflation. It is measuring consumers’ response to inflation! In aggregate, the numerous exclusions from the index and biases in basic methodology account for a significant understatement of inflation. While it is not the most scientific analysis, the following back of the envelope calculation demonstrates my point: The money supply (M3) grew by 11% in 2006. That is a fact. Real (adjusted for inflation) GDP (Gross Domestic Product) was reported at 3.1%. That is also a fact. All other things being equal, the supply of money (11%) exceeded the demand for money (3.1%) by 7.9%. It is reasonable, therefore to argue that 7.9% was a more accurate measure of inflation in 2006 than the reported 2% number. 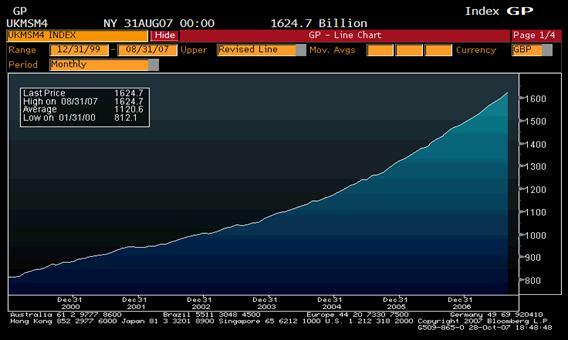 In 2007, US dollar money supply is growing at a staggering 14%. That means that inflation is probably north of 10%. Over time the modern central bank’s role as enforcer of price stability has expanded tremendously. In the United States, the Fed now creates large quantities of new money each year to fund the difference between revenue (taxes) and expenses (government spending), to pay interest on our ballooning national debt and to inject enough liquidity (money) into the financial system to keep markets buoyant and to keep consumers spending. In such an environment in which money supply exceeds demand (real economic growth) by such a large margin, inflation is virtually impossible to control. Inflation is undesirable because it causes interest rates to rise (bad for housing, business financing costs, stock market returns, etc.) and more importantly, it leads people to lose confidence in the purchasing power of their money, something that is critical to the success of any paper based money system as discussed in detail below. To obscure the effects of these inflationary forces, the Fed focuses on something that it can control – inflation expectations. In theory, as long as inflation expectations are low, markets remain calm and prices remain steady. Bond investors will not bid up interest rates because they expect no change to the purchasing power of their future interest payments. Stock investors will assign higher values to equities because they expect companies’ financing costs to be low and the present value of future earnings to be high. Producers of goods and services will not raise prices because they expect that the dollars they receive tomorrow will have as much value as the ones they receive today. Knowing this, the Fed has taken the inflationary effects of excessive monetary growth out of the public eye. It has conditioned the public to focus not upon the money supply, but rather upon the language it uses to explain its (the Fed’s) intentions about relatively tiny changes in the Federal Funds rate and upon very narrow and very misleading measures of inflation such as the Producer Price Index (PPI) and the Consumer Price Index (CPI). It has been so successful here that sometimes it can achieve the effect of a lower or higher fed funds rate without actually changing the rate. It merely alters the tone of its language regarding its intentions. Typically absent from Fed rhetoric, however, is any mention of growth in the US money supply (up over $1 trillion last year). In 2006, the Fed decided to stop publishing the broadest measure of the US money supply, M3. In its news release, it said that “the Board judged that the costs of collecting the underlying data and publishing M3 outweigh(ed) the benefits.�?3. It is unclear what costs were associated with the data collection as most of the individual components of M3 are still published. What is clear however is that M3, a good indicator of monetary inflation, is no longer in the public eye. Inflation has had an impact on how I invest. Up until a couple of years ago, whenever I became nervous about financial markets, I sold securities in order to raise cash. The size of my cash position was typically proportional to my level of apprehension about market risk. At times my cash position was 50% of assets and in the spring and summer of 2004, it averaged 75%. I was very nervous then! While it would seem that large cash balances protected me from the many unpleasant market declines in 2004, my “conservative�? investment position ultimately proved to be a mistake. The market rallied smartly in the 4th quarter, and while I was fortunate to get back in on time, the net result of raising all that cash earlier in the year was to increase my capital gains tax bill. Raising cash was a mistake for another and more important reason. I was exchanging shares in very promising. companies for a currency that loses 6% of its purchasing power every year due to excessive money creation4.That means that a dollar in 1959 was worth 94 cents in 1960 (1 x .94), 88 cents in 1961 (0.94 x .94), 83 cents in 1961 (0.88 x .94) and only 5 cents today (see Appendix V). On the other hand, an investor in the Dow Jones Industrial average in 1959 would have generated a small but positive return on investment over the last 47 years after adjusting for inflation5..
What does any of this have to do with gold? Well, it is clear that we are living in an environment of excessive monetary growth which destroys the purchasing power of cash and which significantly lowers the real (inflation adjusted) return on stocks. It is also clear that stock market volatility is unfriendly to long-term returns6.. If we hold cash, we hold a rapidly deteriorating asset. If we hold stocks, we have some protection from inflation but we take on volatility. From a portfolio or diversification perspective, would it not be useful to invest a portion of ones assets in a currency that is not inflating (is not losing its purchasing power) and that can produce greater than stock market returns because it is undervalued relative to other world currencies? I suggest that gold is a currency that fits this description. Gold has been considered money and a store of value for thousands of years. King Croesus of Lydia introduced the first gold coinage system in the 7th century B.C. Of course many other forms of money have been used since then but none as consistently as gold. People have used salt, sea shells, livestock, stones, silver and various non-precious metals. Today we use checks, banknotes and digital money. The Chinese created the first paper money system in the 9th Century A.D. In the early 18th century, John Law created the first incarnation of our modern financial system - a powerful private bank capable of creating massive amounts of paper money with little or no reserves. Law created one of the most spectacular and speculative investment booms the world had ever seen. When his banking system collapsed, France and the rest of Europe returned to a gold based monetary system. A number of incarnations of the gold standard followed, each of them using gold, to varying degrees, as a regulating mechanism of the money supply. In 1971, the world’s last incarnation of the gold standard ended when the United States suspended dollar convertibility into gold. Since then there has been no official link between gold reserves and money supply, and not coincidentally, we have witnessed the single greatest boom in monetary inflation in history. So what is it about gold that fascinates us? First of all, it has unique physical characteristics. It is chemically inert so it is not subject to decay or transformation. It is essentially indestructible which accounts for why almost all of the gold ever produced is still in existence. It is extraordinarily dense (1 cu ft = ½ ton) which means that very small amounts can function as money of large denominations7. and its consistency and malleability make it highly divisible for purposes of coinage and mobility. Most important, gold is incredibly scarce and “there has never been a moment when it has ceased to be scarce.�? 8. The weight of all of the gold ever produced is approximately 160,000 tons, and as I learned on a recent trip to the Natural History Museum in New York, all of that gold could fit into 16 tractor trailers and if formed into the shape of a cube, the cube would have sides measuring only 20 meters. This last point seemed preposterous to me. How could all the gold produced in the history of the world occupy a space with such limited volume? Upon further investigation I discovered that the weight of one cubic meter of gold is 19.3 tons. The volume of a cube with 20 meter sides is 8000 cubic meters (20 x 20 x 20 = 8,000). 8,000 cubic meters x 19.3 tons per cubic meter = 154,400 tons which is pretty close to the estimate of 160,000 tons of cumulative world gold production! Another of gold’s intriguing characteristics is that the growth rate of its cumulative production has tended to be very close to world population growth and the long-run, real rate of growth of the economy (demand for money). All three are approximately 2% per year. Below I have plotted population and cumulative gold production for the period 1959 – 2006 (Chart 2). During that period, world population and global gold supplies have each grown at about 1.6% per year. The result is that in 1959 there was approximately 0.81 ounces of gold for every person on the planet. Today, 47 years later, the ratio is virtually unchanged. This strangely tight relationship is one of the reasons gold has been such an effective regulating mechanism of the money supply for centuries. One could say that the natural growth in the supply of gold is aligned with the natural growth in the demand for money, namely the increase in world population. On the other hand, the growth in paper money, constrained only by the speed of the central bank printing press, has always been characterized by inflationary oversupply. At this juncture it is tempting to ask if any of this is relevant in today’s world of modern finance. After all, gold no longer has any official regulating power over world money supply and central banks appear to be able to produce endless supplies of paper money without inflationary consequences. Don’t we hear every day that inflation is under control and haven’t we been conditioned to expect modest rates of inflation going forward? If that is true, then where is all of the excess money going? In 1974 my father purchased a car for $5,000. I remember that $5,000 seemed like all of the money in the world! Today’s version of that automobile costs at least $80,000. Is the 2007 version better than the 1974 one? Of course, but it is not fifteen times better. So why has the price increased fifteen fold? Given significant and continuous productivity improvements in automobile manufacturing, it is not unreasonable to argue that the price should have actually decreased. In 2004 I sold an apartment for almost three times what I paid for it in 1992. Why did I receive a return of 200% on an asset that had undergone thirteen years of depreciation? Some might argue that this has little to do with inflation and more to do with an increase in demand for housing. They miss the point. The increase in demand for housing was driven by the easy money policies of the Federal Reserve. Between 1992 and 2004, the US money supply more than doubled and by 2004 1% short-term interest rates fueled a massive increase in real estate demand. All of the associated lending is by definition inflationary.9. There seems to be no limit to the prices private equity firms are willing to pay for the businesses they want to take private (at least until the sub-prime meltdown this past summer). Two years ago we did not hear about 10, 20 and 30 billion dollar deals but they are commonplace today. Are the businesses that these firms are buying that much better than they were two years ago? Of course not but much of the central bank created “excess money�? is at work in private equity and is facilitating the financing of these ever increasing price tags. Inflation is evident in many other areas as well. Oil, food, taxi rides, education costs, insurance, rent, stamps and subway tokens are inflating faster than official statistics suggest. All of this is inflation that exceeds what we have been conditioned to expect. Ironically, back in 2004 when I was exchanging most of my securities for depreciating US dollars, I was reading Bob Woodward’s book, “Plan of Attack�?, in which there is an unforgettable scene relating to US dollar inflation in Iraq just prior to the commencement of the war. CIA operatives were transporting “tens of millions of dollars in U.S. $100 bills stored in black Pelican boxes�?10. into Turkey to finance their intelligence operations. They “found that $1 million in $100 bills weighed 44 pounds and fit neatly into a day backpack.�?11. Later “The $100 bills had caused extreme inflation. It seemed even a cup of coffee was going for $100 because no one could make small change.�?12. This past February it was reported that 363 tons of $100 bills, loaded on wooden pallets, were shipped to Iraq and lost13.. The estimated value was reported to be $12 billion! What struck me most about this account was that the transaction required such a large quantity of bills that it was characterized by weight instead of value. When did US dollar printing become so prolific that we could create and then nonchalantly lose hundreds of tons of them? It also occurred to me that while the loss of $12 billion in cash barely received a headline, if we had lost $12 billion of gold it would have been considered a national disaster. This led me to wonder, rhetorically of course, why the US Treasury, the world’s largest holder of gold (see Appendix I), did not send $12 billion in gold instead of $12 billion in $100 dollar bills. While the weight would have been greater (561 tons vs. 363), the much smaller footprint (volume = 8 cubic feet) would have attracted far less undesirable media attention. Furthermore, the universal acceptance of gold as wealth would have increased the chances that we received something of value in return for our money. I doubt people would have been buying cups of coffee with gold coins nor do I think that billions of dollars in gold would have been lost. The answer to my earlier rhetorical musings is obvious. Gold, at the current US dollar exchange rate, is an inappropriate substitute for dollars. The price is too low. The type of unrestrained paper money creation that we are witnessing today, not just in the US but around the world, has occurred over and over again throughout the history of paper money. Almost everyone is familiar with the hyperinflation of post-World War I Germany where it was said that people had to carry their cash in shopping carts. During World War II, the United States printed and shipped to China all of the currency for Chaing Kai-shek’s government. Inflation was so severe there that “stacks of paper money were absorbing more and more precious cargo space�?14. on the supply planes. In 18th century France, at the height of John Law’s new banking system, “eight printers, each of whom earned only 500 livres a year, were employed around the clock printing 100-, 50- and 10- livre notes.�?15. And who can forget Fed Chairman Ben Bernanke’s 2002 speech in which he said “the U.S. government has a technology, called a printing press (or, today, its electronic equivalent), that allows it to produce as many U.S. dollars as it wishes at essentially no cost.�?16. This last point, creating wealth at no cost, has been the primary allure of every paper based money system. A number of these have been remarkably successful, for a time. In each case, the key to success is convincing the public not only that the paper has value but also that its supply will not be excessive. It is only then that people will trade it for other objects of value. In 13th century China, Kublai Khan’s paper money system had value because “no one dare (d) refuse it on pain of losing his life�?.17. Back in 18th century France, and before the spectacular collapse of John Law’s paper money system, his bank notes and shares in his Mississippi Company (which took on the status of money) fueled an unprecedented era of wealth creation. Huge fortunes were created and as long as there was no doubt about the value of the paper, those fortunes continued to grow. Of course doubt eventually arose and the paper became worthless, quickly. The term “millionaire�? was first used in that era and it soon became a common title. Today we use the term “billionaire�? almost as loosely. Why is it that billionaires today seem almost as common as millionaires did 25 years ago? Is it that people are much better at making money or is it that there is just a lot more money around? While it is true that there has never been a paper currency that has maintained its purchasing power, the purpose of this paper is not to predict the demise of the US dollar or any other money system. Rather it is to compare gold money to its competitors (the dollar, the Euro, the Yen, the Rubble, etc.) and to demonstrate not only that it is undervalued but also that it has an important role in any portfolio of securities. One routinely hears that gold lost its monetary significance with the end of the gold standard. However, it is precisely for this reason that gold has acquired the attractive investment characteristics of a currency. Under a gold standard, the price of a unit of currency is fixed to a specified amount of gold. e.g. the gold price was fixed at US$35 per ounce from 1935 to 1971. In 1960, an investor was indifferent to holding gold or US dollars because the exchange rate was unlikely to change. If the exchange rate was incorrect, there was no way to profit by investing in one versus the other. Today gold has a floating exchange rate just like other currencies and that rate fluctuates every trading day based on a whole host of factors. As a portfolio manager with cash balances, I can hold my cash in any currency I chose, including gold. I am unlikely to hold Venezuelan Pesos because I think the Peso will be significantly devalued. I could buy Euros but the supply of new Euros is currently growing almost as rapidly as dollars. I could also buy gold whose supply tends to grow in line with the demand for new money (loses no purchasing power). While this will more than compensate me for not receiving interest, an even more compelling reason is that the market is assigning an unrealistically low exchange rate to gold (it is cheap relative to other currencies). The mis-pricing of gold money is largely a function of the public’s expectation for moderate inflation. So let’s look at current US dollar inflation and examine how these new dollars come into existence. As discussed earlier, M3 is a good measure of the US dollar money supply (all dollars in circulation). At the end of 2006, M3 was approximately $11.2 trillion. Chart 4 shows the history of the growth in M3 since 1959. Since 1971, when dollar convertibility into gold ended, the supply of dollars in circulation has increased by over 1400%. 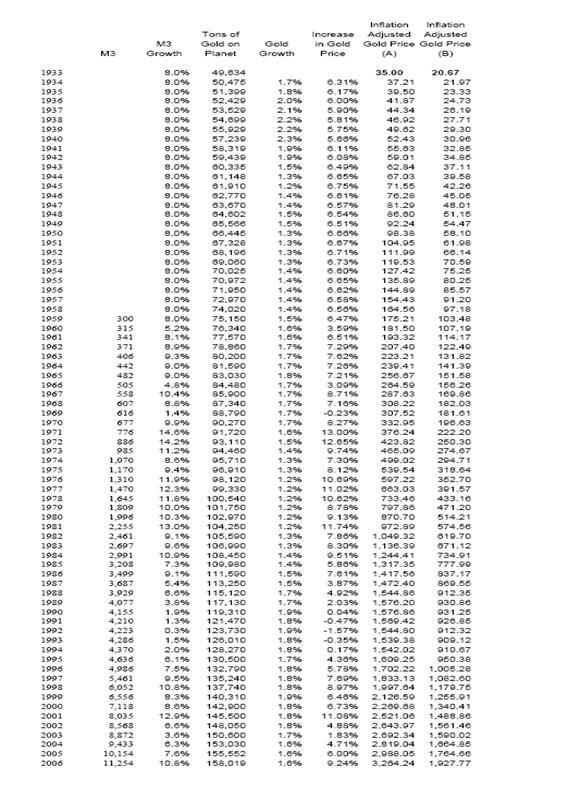 That’s right, a 14 fold increase in 36 years. The US Federal Reserve Bank injects these new dollars into the money supply in several ways. First, it uses newly printed dollars to purchase old US treasury securities in the open market. This immediately increases the number of dollars in circulation. In some cases, the Fed prints money in order to purchase new securities directly from the US Treasury. This occurs when the public markets, foreign or domestic, are unwilling to lend the Treasury as much money as it requires to fund the shortfall between government revenue (taxes) and government expenses. The Fed turns on the printing press and buys whatever bonds the Treasury has been unable to sell. Upon receipt of these new dollars, the Treasury pays its bills and thereby injects the new dollars into the money supply. In reality, some of these dollars come off the printing press but most are created in electronic form. In either case, the effect on the money supply is the same. All the newly created dollars enter the banking system which then lends them to borrowers, creating even more new dollars. Ultimately, each new dollar becomes many dollars in the overall money supply because every time it is loaned to someone, that person’s bank re-loans part of it to someone else. The number of times it can be lent is known as the money multiplier. The size of the multiplier is a function of the level of reserves that a bank is required to hold. If reserve requirements are 20%, then 80 cents of each dollar can be re-lent each time it changes hands. Changing reserve requirements therefore represents the second way the Fed influences the money supply. Lowering reserve requirements increases the money multiplier and the money supply and increasing reserve requirements has the opposite effect. Today, in the United States, the money multiplier is essentially infinite because the Fed has, for all practical purposes, reduced reserve requirements to zero18.. As a result, the throttle on the money supply, as it relates to reserve requirements, is wide open19.. The third and final way the Fed increases the money supply is by lowering the discount rate, the rate at which it loans newly printed money to member banks. By making loans to these banks, the Fed increases their reserves and thus increases the money supply. Central banks around the world, not just the US Federal Reserve, have been creating excessive amounts of money. Below I have included money supply charts for India, Russia, the UK and the Euro Zone for the period 2000 to the present. In India the money supply has more than tripled over the last 7 years and is currently growing faster than 20%, 11% greater than the demand for new money (economy growing at 9%). As we see later, the Russian central bank has signaled its intention to double the size of its gold reserves. While foreign central banks create money for many of the same reasons as the US Federal Reserve, it is an inescapable fact that the size of the US credit expansion combined with the resulting amount of US money creation have a profound impact on the volume of money creation abroad. For instance, as the US buys an increasing amount of goods and services from India without a corresponding increase of Indian purchases of US goods and services, we bid the price of the rupee higher relative to the US dollar. India finds this undesirable (a higher rupee makes their exports more expensive) so they print new rupees in order to buy US dollars and bid up the price of the dollar in foreign exchange markets. It was reported recently that the Indian “reserve bank ended up buying $8 billion of U.S. currency from November to January to keep the rupee from rising too much.�?20. I could have chosen any number of countries to cite in the above example. All we need to do is look at the US dollar holdings of central banks to see the magnitude of foreign currency printing for the purpose of buying US dollars. "Foreign exchange reserves (US dollars) have soared across much of the developing world, in countries as diverse as Brazil, Thailand and India, but particularly in China. The reason lies in powerful currency intervention, as these countries strive to keep their exports competitive in Western markets by curbing the appreciation of their currencies against the dollar."21. To summarize – Foreigners like US monetary expansion because many of the newly created dollars get spent on their goods and services. On the other hand, they do not like the upward pressure that US buying puts on the price of their domestic currencies so they devalue their own money by printing more of it. This keeps their money cheap and their exports affordable which leads us to buy more of their exports with even more printed money. The cycle keeps going. What we end up with is a global competitive currency print-off in which success, perversely, is measured by the level of currency weakness rather than strength. To really comprehend the inflationary environment that I have described, it is important to understand the amount of debt that is building in the system. At the end of 2006, total US government, corporate and individual debt (not including unfunded liabilities for Medicare and Social Security which are estimated at $40 trillion) was $44.55 trillion22.. This is the current, interest bearing debt of the US. To put this number in perspective, consider that it is almost equivalent to world GDP of $47.77 trillion23.. The debt of US individuals is a staggering $12 trillion (Chart 9). That is ten times the size of the economy of our largest trading partner, Canada. The national debt (government debt) was $8.68 trillion at the end of 2006, up $1/2 a trillion from 2005. As this unprecedented credit expansion grows, it takes an ever increasing amount of new money to service the debt (we issue new debt to pay interest on the old debt). Furthermore, many of the new US dollars that are accumulating in foreign central banks actually get lent back to us which creates even more debt. e.g. China uses the dollars it accumulates from trade or from currency intervention to buy US government securities. This new loan from China gives us back the money we originally spent, allowing us to spend it once again. The price we pay is the additional interest and principal repayment obligation on the new debt. This requires more new money creation. We are now approaching the point at which foreign central banks are questioning the prudence of continuing to print excess quantities of their own currency for the purpose of mopping up our newly created dollars. In China, this imported inflation can be seen in the excessive growth of the domestic money supply which now stands at 37 trillion Yuan, almost two times the country’s gross domestic product (GDP). This compares to the mid 1990s when Chinese money supply was less than one times GDP24.. Recently China signaled its intention to diversify its reserves into other assets such as private equity, gold, non-US dollar currencies, etc. A number of other countries, including Kuwait, Syria and the UAE have also signaled their intention to reduce their US dollar reserves. It is not difficult to understand that any material reduction in the propensity of foreign central banks to hold US dollars will put significant pressure on our already vulnerable currency. Of even greater concern is the idea that the dollar is vulnerable to an attack from another nation. It is unlikely that this fact has escaped Russian Premier Vladimir Putin who, to the surprise of his critics, has led Russia back into a position of strength on the world stage, not through military might but through his skillful manipulation of the levers of economic power. Following Russia’s post-Soviet era social and economic devastation of the 1990s and the 1998 Russian debt crisis, the country, under Putin’s leadership, has produced the world’s best performing stock market and one of the world’s fastest growing economies. Putin’s economic reforms and leveraging of Russia’s wealth of prized natural resources has generated large trade and budget surpluses as well as huge foreign exchange reserves. While much has been made of Putin’s recent comments about a renewed cold war, I suggest that we should be more concerned about Russia’s ability to wage a much more subtle war, backed by a powerful economy, against the US dollar. So how might such an attack upon the dollar take place? As the world’s largest exporter of natural gas and the second largest exporter of oil, Russia has a tremendous amount of political and economic leverage. As we saw last year when it interrupted the supply of natural gas to the Ukraine over a pricing dispute, Putin is not afraid to use this leverage. Furthermore, Russia has the ability to influence how energy is traded in Europe, and indeed throughout the world. Oil, as with most commodities, is traded on international markets in US dollars. Given the size of the global oil trade, this provides a tremendous amount of demand, and thus pricing support, for the dollar. It is clear that Putin would like to unseat the dollar’s monopoly position in the global energy trade. In his 2006 State of the Nation speech to parliament, he called for "a stock exchange in Russia to trade oil, gas and other goods to be paid for in rubles�? 25. and on other occasions he has lobbied for a Euro-denominated oil exchange. If either of these proposals were to gain traction, we would likely see a significant global reduction in demand for dollars and an increase in foreign central banks’ desire to sell their US dollar reserves. Unfortunately we are ill-equipped to defend against such an assault. So we return to the central question of this paper. Into which currency should we denominate our cash balances? While the US dollar has unique headwinds as described above, all world currencies are depreciating rapidly due to chronic oversupply. We can attempt to determine which one is declining the least, or we can focus upon gold, a currency whose supply is unequivocally constrained, as demonstrated by centuries of production statistics, and whose demand is likely to grow in proportion to the growth in the supply of other currencies. Let’s start by reviewing some of the supply and demand statistics for the gold market as shown in Chart 9 covering the years 2003 – 2006. Mine production has been flat in recent years, and despite a substantial increase in global mining activity and exploration spending since the current bull market in gold began in 2001, production actually declined in 2006 to 2,467 tons from 2,522 tons in 2005. This should not be surprising. The historical data show that both the scale of existing stocks and the annual production of gold are unlike that of industrial or agricultural commodities – such as porkbellies, oil, lumber, or copper. Gold output cannot be increased substantially relative to total stocks in a short time-frame by either intensified exploration or scale-production techniques. Thus it should not be surprising to discover that the stock of gold for a generation, a century, has increased on average about 2% a year.26. Gold’s relative inelasticity to both price and capital investment (higher gold prices and the building of more gold mines don’t provoke significant increases in production) is the primary reason gold has remained scarce throughout many commodity investment cycles and indeed for thousands of years. What is particularly interesting about the current production statistics is that we are in the middle of the biggest gold bull market in 27 years (gold price being the yardstick) and the industry is not able to achieve even its low, historical growth rate of 2%. So while paper money is growing at unprecedented rates, gold money production is moving in the other direction! Even with a 20% increase in “Old Gold Scrap�? 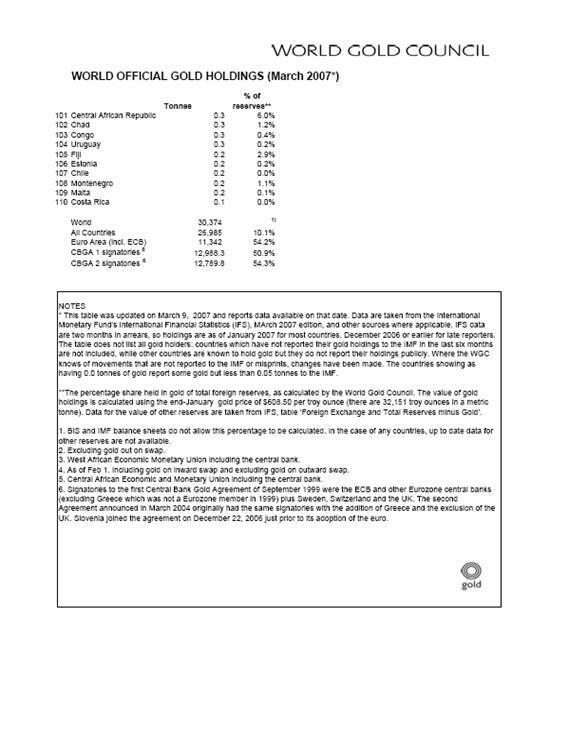 sales in 2006, global gold supply declined by 5%. The second line in Chart 10, “Official Sector Sales�?, refers to the sale of gold by central banks around the world. These banks currently hold approximately 30,000 tons (1 billion ounces) of gold, representing 19% of the world’s cumulative production or 12 years of global production at the current rate of 80 million ounces a year. It is a common misperception that the gold price is unlikely to climb significantly from current levels because central bank gold is a massive source of potential supply that is capable of overwhelming any conceivable demand scenario. Proponents of this view claim that central banks no longer want their gold and are looking for a way to monetize (sell) their holdings. While I consider this view to be ill-informed and naive, its position in mainstream thinking merits some discussion here. The simplest way to discredit the above argument is to look at what central banks are actually doing with their gold. In 1999, 14 European central banks signed an agreement27. limiting the amount of gold they could collectively sell in any given year to 400 tons. The agreement was renewed in 2004 increasing the annual limit to 500 tons. There are several important points here. First, the annual sales limit is only 1.6% of total central bank holdings. Second, only a handful of the signatories actually sold any of their gold in the entire 8 year period since the first agreement took effect. In 2006, only five of the signatory banks sold gold and these sold only 383 tons, 127 tons less than the 500 tons allowed. Germany, the second largest holder of gold with 3,423 tons, has sold none of its gold since 2000 and Herr Axel Weber, the President of the German Bundesbank has openly expressed his reluctance to sell the bank’s gold. Italy, the fifth largest holder of gold has sold none of its gold since 1998. The United States, by far the largest holder of gold has sold less than 5% of its gold since 1973 and has sold none of its gold in the last decade. Even if the US decided to sell all of its 8,133 tons of gold, and assuming it could get the current market price of $785/oz, the sale would net approximately $205 billion 28. This is roughly 2/3rds the value of Microsoft and hardly enough to have any material impact of our growing national debt. In aggregate, the total volume of central bank gold sales since 1973 has been 16% of total holdings and the majority of those sales have been isolated to a handful of countries. So, contrary to popular opinion, central banks are keeping a tight grip on their gold. Today, we may be witnessing a significant shift in trend whereby central banks are actually buying gold or signaling their intention to do so. Argentina, no stranger to the consequences of un-sound money, bought 55 tons of gold in 2004. Last year the Russian central bank announced its intention to increase the size of its gold reserves from 5% to 10%. South Africa has announced a similar initiative and it is widely rumored that the Chinese central bank, which bought 99 tons of gold in 2002, may be adding to its reserves once again. None of this should be very surprising. After all, why would a central bank trade its valuable gold holdings for the same kind of money that it can reproduce at virtually no cost? In a supply constrained market, small changes in demand have a significant impact on price. We saw this in 2006 when total supply (mine output + central bank sales + scrap) fell in the face of rising demand. This caused more than a $100/oz increase in the gold price. This is the dynamic that first attracted me to the gold market in 2002. Then, as now, I felt that a small increase in investment demand would have a dramatic increase in the metal’s price as well as the value of the companies that mine for it. One has only to compare the current value of the global capital markets ($41 trillion) to the value of one year of gold production ($154 billion) or all the world’s gold companies ($200 billion) to understand how significant even a 1/10th of 1% increase in investment demand might be. Over the last 5 years we have begun to see a shift in market sentiment towards gold. The emergence of several gold ETFs (Electronically Traded Funds) indicates a new willingness on the part of investors to own physical gold. Demand in emerging markets, especially India, is growing rapidly. Many of the new middle class in these countries are showing an inclination to convert some of their savings into gold. Producers themselves have been buying large quantities of gold due to their inability to find enough of the metal for delivery into their hedge books and central banks, as described above, may soon surprise the markets by becoming net buyers of gold. So how high can the gold price go? To answer this question I have presented four valuations methodologies below. In the first, I arrive at a valuation based on anticipated (future) levels of inflation. In the next three, I rely primarily on historical data to estimate an appropriate present day price. Individually, each method has flaws. However, in aggregate they make a compelling argument for a much higher gold price. “by 2030, the federal budget deficit will approach 9 percent of GDP – more than four times greater as a share of GDP than the deficit in fiscal year 2006. A particularly worrisome aspect of this projection and similar ones is the implied evolution of the national debt and the associated interest payments to government bondholders.�? “According to the CBO <Congressional Budget Office> projection that I have been discussing, interest payments on the government’s debt will reach 4-1/2 percent of GDP in 2030, nearly three times their current size relative to national output. Under this scenario, the ratio of federal debt held by the public would climb from 37 percent currently to roughly 100 percent in 2030 and would continue to grow exponentially after that.�?29. Clearly, if either of the above scenarios comes to pass (a deficit = 9% of GDP or debt = 100% of GDP), huge amounts of new money will need to be created. In Appendix II, I have attempted to quantify these increases with a very simple model. The implied present value of the future money creation is somewhere between $16.3 trillion and $21.1 trillion. Said another way, this would represent a 146% - 188% increase in the money supply. Assuming that the gold price should grow in proportion to the money supply and given the $16.3 trillion and $21.1 trillion are the present values of future money creation, the implied current gold price, from this analysis, should be between $1,931/oz30. and $2,260/oz31..
As so many people refer to the 1980 peak gold price of $850, let’s start by looking at gold relative to the US money supply in that year. 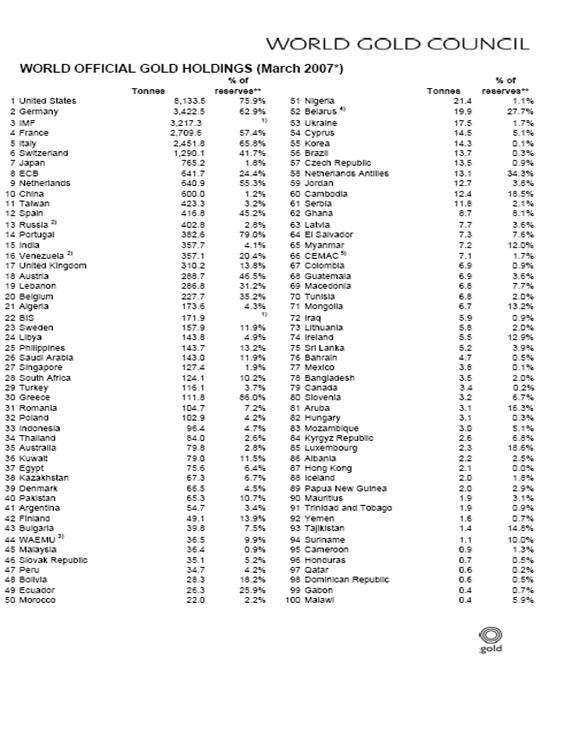 Chart 11 compares the value of all the gold on the planet to the total number of dollars in circulation. At the end of 1980, the value of all the gold on the planet and dollars in circulation was almost the same. Today number of dollars vastly exceeds the value of world gold. The blue line is calculated by multiplying the year-end gold price by the total volume of gold on the planet, adjusted each year for actual production. The purple line is the US money supply (M3) as reported by the Federal Reserve. 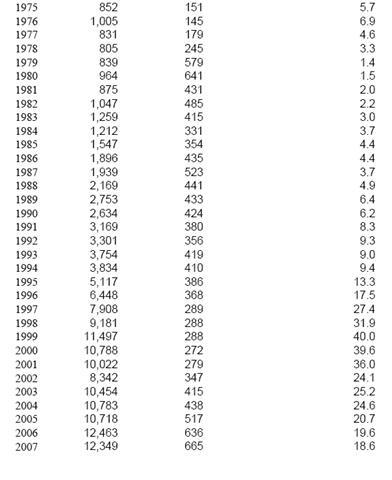 In 1980, the year-end gold price was $641/Oz and there were approximately 3.31 billion ounces of historical production. This yielded a total value of $2.1 trillion. Interestingly, the year-end US money supply was very close to this figure at $1.96 trillion (see where the 2 lines meet). Specifically, gold represented 106% of the money supply (M3). 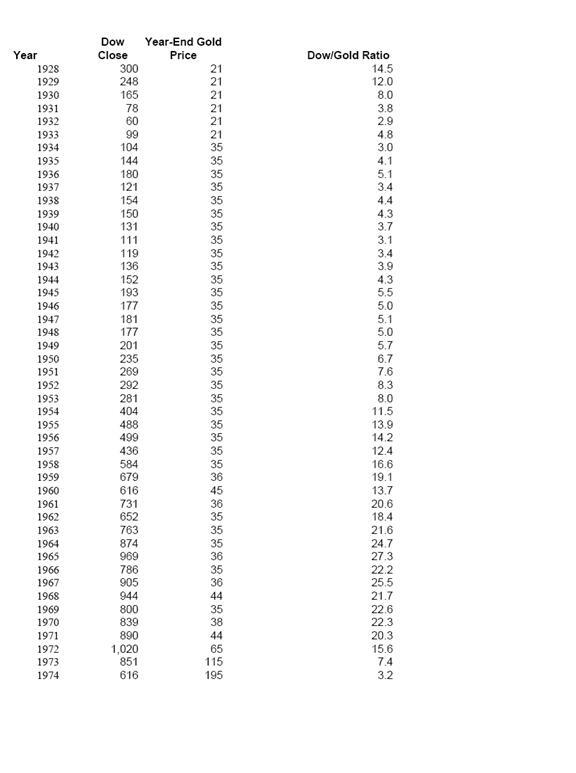 If we had used the peak gold price in 1980 of $850/Oz, global gold would have been 141% of the M3. Today, the value of all the world’s gold is about 30% of M3. This shows how irrelevant it is to look at the current gold price relative to historical prices without adjusting for inflation of the money supply. Assuming that the 1980 year-end gold price was the appropriate value for gold, what would the gold price have to be today in order for the world’s gold to once again equal the level of M3? The answer is $2,215/Oz32. This is the value per ounce that would be required for the blue line and the purple line to cross once again as they did in 1980. The gold price would need to be $3,123/Oz33. in order for the value of global gold to equal 141% of M3 as it did when gold hit $850/Oz. One issue with the valuation methodology above is that it assumes that the gold price at the end of 1980 was the correct value. i.e. that gold was really worth $641/Oz. If the market was assigning an incorrect price to the metal, then the inflation adjusted price of $2,215/Oz could be way off. So let’s go back to 1934 and let’s use the $34/Oz gold price then as our reference point. Theoretically, if gold supply and the money supply grow at the same rate, the gold price should be stable. i.e. the supply of one will not outpace the supply of the other and the exchange rate will remain constant. Because the money supply has grown much more rapidly than the gold supply (number of ounces mined) since 193434., the value of gold relative to dollars has increased by the difference in the growth rates each year. Based on this formula, and assuming $34/Oz was the correct value in 1934, the theoretical gold price at the end of 2006 was $3,264/oz (see Appendix VII). If we assume that $34/Oz was too high, given President Roosevelt had just devalued the dollar relative to gold, and we assume that the pre-devaluation gold price of $20.67/Oz was correct, then the theoretical gold price at the end of 2006 would have been $1,927/oz (see Appendix VII). 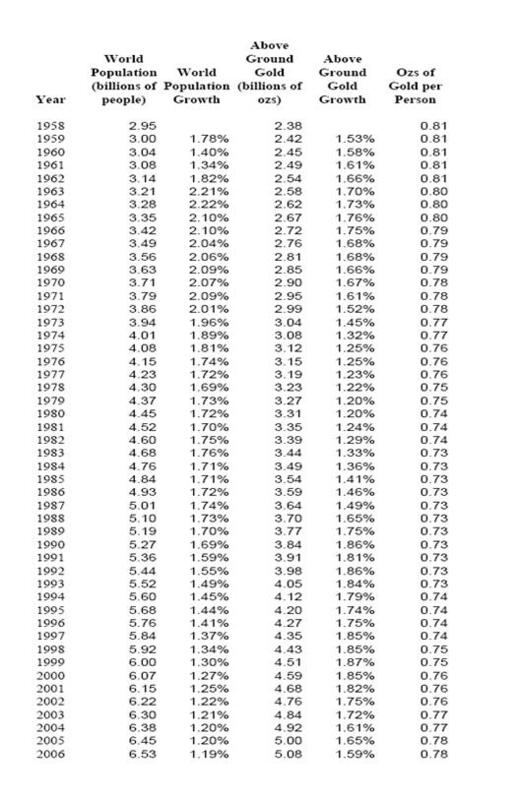 Now let’s look at the gold price relative to the price of stocks over the last 79 years. A popular way to do this is to compare the gold price to the price of the Dow Jones Industrial average. Today, with the Dow trading at about 13,800 and the gold price at $785, the Dow/Gold ratio is 17.6 (13,800/785 = 20.9). In 1980, when the gold price hit $850/Oz, the ratio was less than 2. At the peak of the internet bubble, when the gold price was $255/Oz, the ratio was close to 44. On a number of occasions in the 20th century the ratio was below 5. During these periods investor sentiment was very positive towards gold relative to stocks. As I believe investor sentiment will return to these levels, it is not un-reasonable to suggest that the Dow/Gold ratio will approach 5 or lower again. If we assume that occurs with the Dow at current levels, the implied gold price is $2,704/Oz (13,522/5 = $2,704). 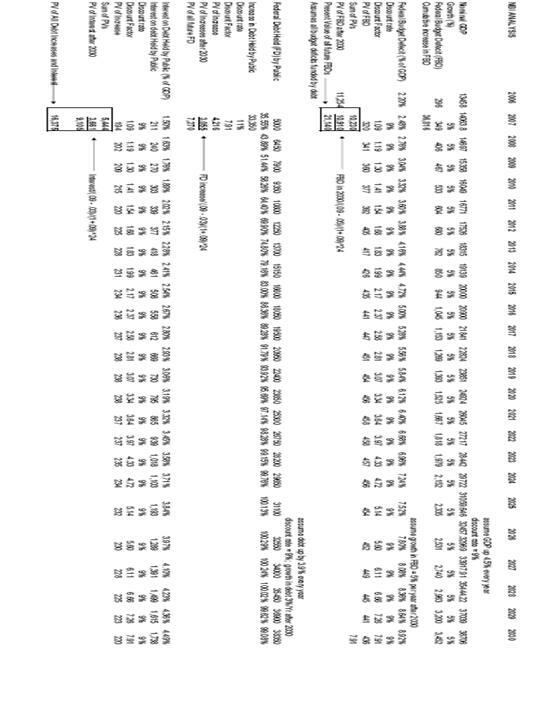 Earlier in the year I stumbled across the following chart35. which shows US government debt levels based on data collected from the U.S. Government Accounting Office (GAO). The blue/green line shows government debt going from a fraction of GDP to an unmanageable multiple of GDP. When I first saw this chart, I dismissed the analysis as purely hypothetical. But then I compared it to the previously referenced speech by Fed Chairman Ben Bernanke in which he warns of the potential for US government debt to reach 100% of GDP by 203036.. Notice from Chart 13 that the green line (Projected Government Debt) reaches 100% of the red line (GDP) very close to 2030. i.e. The Fed’s own analysis is very similar to the alarming trends depicted in Chart 13 and points to the magnitude of potential credit induced money creation as US debt levels rise. Clearly our economy could not sustain the levels of debt implied above and significant policy changes are critical in order to avoid such an outcome. However that is a topic beyond the scope of this paper. My objective in these pages has been to demonstrate, from an investment perspective, the relevance of gold in today’s inflationary environment. While the gold price has advanced significantly in the past seven years, it has not come close to reflecting past global currency depreciation, nor does it capture the amount of future currency depreciation implied by the trajectory of the current credit market expansion. The US dollar exchange rate for gold will need to approach $2,500 per ounce before this can occur. It is not difficult to see where the required demand will come from to drive the gold price to such a level. Collectively, retail and professional investors have a miniscule stake in the gold market and little understanding of its fundamentals. It will take a very small change in their attitude towards gold to have a significant impact on its price. This, coupled with diminishing central bank sales, and perhaps even net purchases, and significant demand from the growing middle classes in India and China create a scenario in which gold could exceed the various price targets I have suggested in this paper. Appendix I - Central Bank Gold 37. 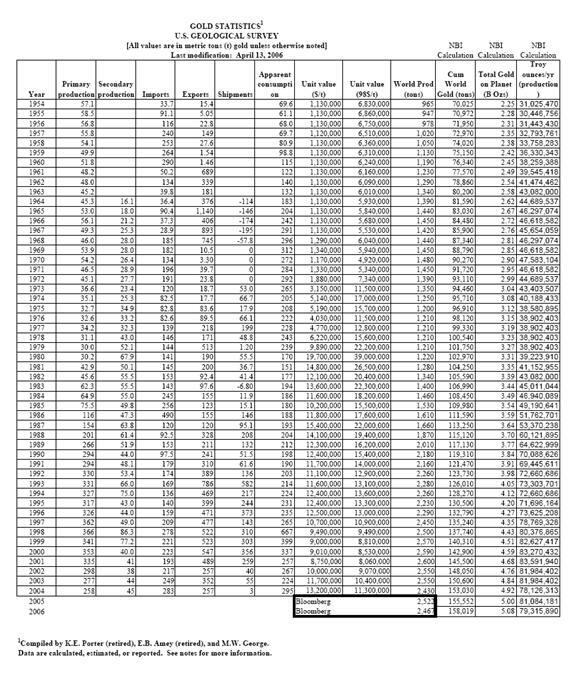 Appendix II- Valuation Methodology 138. While stock prices rise and fall for many reasons, it is clear that monetary inflation gives them a material and consistent upward bias. This last point is easier to understand if we look at returns over a longer period. Since 1959, the Dow Jones Industrial Average has increased on average by 7.5% a year. Interestingly, that is pretty close to the 8% annual growth in the money supply over the same period. If we factor in the annual 2% real growth in the economy, it would seem that a stock investor can anticipate a return of 1.5% per year (7.5% - [8% - 2%] = 1.5%)39.. Unfortunately the math is not that simple and the above small, yet positive return scenario is worse than it first seems. The problem is that the steady and always positive increase in the money supply is a much more powerful force than the erratic and sometimes negative returns of the stock market. The culprit is volatility. While the average annual stock market return has been 7.5%, there have been many years when the return was negative and this kind of volatility has a harmful impact on long-term returns.40. The result is that $1 invested in the Dow in 1959 would be worth only $0.93 cents today after compensating for inflation. That same dollar would be worth only $1.52 after inflation if the stock market return was consistently 7.5% each year. In Chart 2 I have plotted these various return scenarios. The blue line is the inflation adjusted stock market return since 1959. The purple line is the inflation adjusted, hypothetical 7.5% annual stock market return that in reality does not occur because of volatility. The yellow line is the inflation adjusted value of a dollar held in cash and not earning interest. All three scenarios are disturbing because they highlight the destructive power of monetary inflation, a phenomena that is rarely discussed in the media or by the Federal Reserve. 1. Planned Change In The Consumer Price Index Formula April 16, 1998; US Department of Labor, Bureau of Labor Statistics website (http://www.bls.gov/cpi/cpigm02.htm). 2. Planned Change In The Consumer Price Index Formula April 16, 1998; US Department of Labor, Bureau of Labor Statistics website (http://www.bls.gov/cpi/cpigm02.htm). 3. 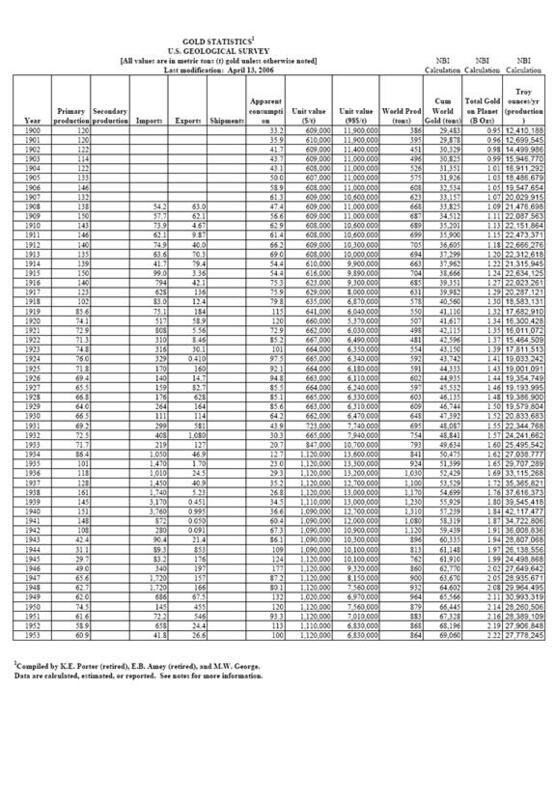 Federal Reserve Statistical Release, November 10, 2005, revised March 9, 2006. 4. On average, the Federal Reserve has increased the supply of new dollars by 8% every year since 1959. If we conservatively assume that the real growth in the economy (demand for new money) was 2% per year over that period, then inflation has averaged 6% (8% - 2% = 6%). 5. In Appendix VIII I analyze the effects of inflation on cash and the effect of inflation and volatility on stock market returns. 6. In Appendix VIII I show how volatility undermines equity market returns. 7. Peter L. Bernstein, The Power of Gold, p.3. 9. Because of fractional reserve banking, every time a bank makes a loan, it is creating new money. 17. Peter L. Bernstein, The Power of Gold, p. 167. 18. Most money in the financial system is exempt from reserve requirements, such as savings accounts and time deposits. Technically, checking account balances are subject to reserve requirements, but in reality banks can easily reclassify them such that the requirements do not apply. 19. A common mistake that some financial commentators make is to refer to the stability in M1, a much narrower measure of the money supply than M3, as evidence of slow monetary growth. The problem with this argument is that with zero percent reserve requirements and the relaxation of other fed requirements, much of today’s newly printed money enters the money supply upstream of M1. 20. Bloomberg News, March 22, 2007. 21. New York Times, March 6, 2007. 24. Andy Mukherjee, “Hard Landing Risk Is Rising for China’s Economy�?. 28. 8,133 tons x 32,150 oz/ton x $785/oz = $205 billion. 29. Statement of Ben S. Bernanke, Chairman, Board of Governors of the Federal Reserve System, before the Committee on the Budget, United States Senate, January 18, 2007. 32. The money supply (M3) at the end of 2006 was $11.254 trillion and there were approx. 5.08 billion ozs of above ground gold. So $11.254 trillion divided by 5.08 billion = 2,215. 34. Because we do not have accurate estimates of the US money supply before 1959, I have assumed the money supply grew at 8% per year between 1933 and 1959, the same as the average of the annual increase between 1959 and 2006. 36. Statement of Ben S. Bernanke, Chairman, Board of Governors of the Federal Reserve System, before the Committee on the Budget, United States Senate, January 18, 2007. 39. 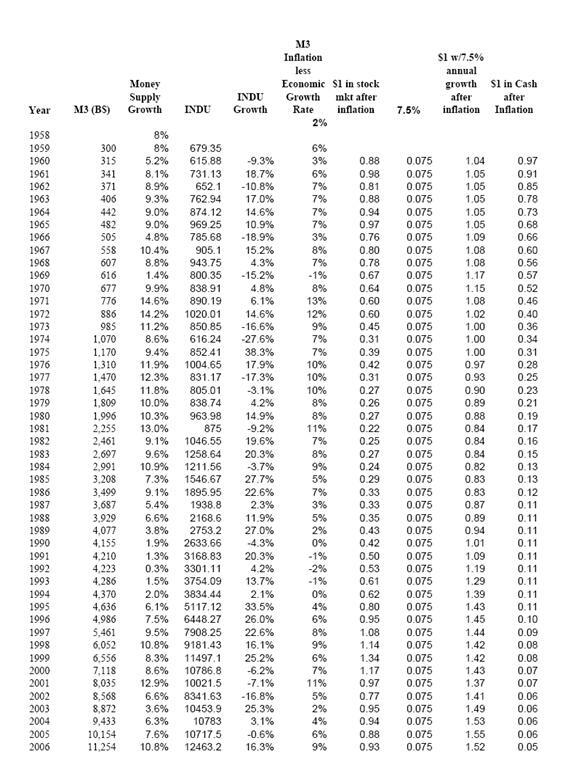 None of the market returns discussed in this paper include reinvested dividends. 40. $1 that grows by 5% the first year and 5% the second year is worth more than a dollar that grows by 15% the first year and -5% the second year even though the sum of the percentages is each scenario is the same ($1 x 1.05 x 1.05 = 1.1025; $1 x 1.15 x .95 = 1.0925). This paper is not intended to provide investment advice and should not be relied on to do so. You should consult with your own investment advisor before deciding to follow any investment strategy or purchase any investment interests. Northern Border Capital Management LLC and its affiliates may own, purchase and/or sell certain of the investment interests described in this paper on behalf of themselves and their respective clients.